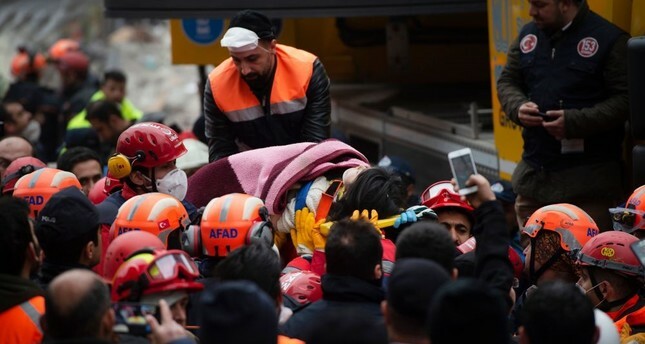 Rescue crews evacuate Havva Tekgöz from the rubble some 19 hours after the collapse in Istanbul's Kartal district on Feb. 7, 2019. "Is Havva alive?" a woman muttered as paramedics were putting a brace around her neck and trying to move her to a stretcher on Tuesday. Havva turned out to be alive about 18 hours after the apartment building she lived in with her family in Istanbul's Kartal district suddenly collapsed. Her miraculous survival gave hope to scores of people gathered around the eight-story building where rescue crews and firefighters were carefully picking through the debris to examine whether they were people trapped under tons of concrete slabs. Yet, three more bodies were extracted from the rubble yesterday, bringing death toll to six. Havva, her mother Nazan, who was among the first to be evacuated from the building on a stretcher, and 11 others are being treated at hospitals, while an unknown number of people are believed to be trapped in the rubble. Officials have not confirmed the total number of people nor the cause of the collapse, though illegal additions to the building are likely the main culprit. Officials announced on Wednesday that the building's three floors were built illegally and a textile workshop on the first floor was not registered with authorities. When Daily Sabah went to print, rescue crews were still sifting through the rubble of the building where official records reportedly show 43 people were registered as residents in 14 apartments. Environment and Urbanization Minister Murat Kurum visited the injured at a Kartal hospital, where they were taken, and spoke to reporters. "All the injured victims are in good health now. Crews are working very fast on the rubble, and we want to rescue more people as soon as possible," Kurum said. He said President Recep Tayyip Erdoğan, who dispatched two ministers to the scene after the collapse, was closely monitoring the rescue process. The minister refused to give the number of people unaccounted for but said that along with residents, there were "guests" in the building. "Crews reported sounds coming from the rubble, and they use devices to locate the sounds for signs of life," he said. Seven buildings near the collapsed one were evacuated while authorities said one building was under serious risk of collapse. A few cars parked around the building were damaged, but the collapse did not damage nearby buildings. Security camera footage shows the building tumble down all of a sudden and passersby running for cover before a cloud of smoke covers the street. The chief prosecutor's office launched an investigation into the incident, while locals claim the building "shook" two days before the collapse. Speaking to İhlas News Agency, Davut Ayaz, whose nephews were among those trapped under the rubble, said there could have been more casualties if the collapse happened on Tuesday when a large, open-air marketplace teeming with shoppers is set up weekly near the building. Ayaz, who lives in a nearby building, said most buildings in the neighborhood were "not healthy," and people are anxious. Nedim Alemdar, the father of 9-year-old Tayyip Mahmut Alemdar who was pulled alive from the rubble nine hours after the collapse, said their large sofas in their living room provided cover for his son when the building collapsed. He told Demirören News Agency that he has been a resident of the building for 25 years, along with his relatives and knew "there were some problems" about the structure "but we don't know it was that dire." "I'm shocked how builders erected this building and how they received construction permits," he said. Some media outlets published photos allegedly from the rubble showing sea shells in the wreckage, indicating that the building was constructed with use of sand, which banned from use in construction.